It is hard to believe that one month is already in the books for 2016! 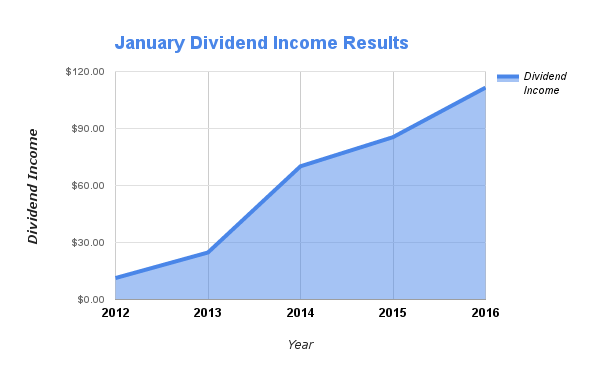 January got off to a really good start for our dividend income results. There were no new records set but we did hit triple digits, which is a first for the month of January. While it wasn’t our highest recorded dividend income month ever, we had our best January result! This past January proved that our portfolio is continuing to grow at a nice pace. This is just another little reminder that the new money we are investing is working for our family. Of course, we are also continuing to reinvest our dividends into new stock and are enjoying annual dividend increases from the companies we own. Note – I forgot to include our dividend income from SYY during January, so our totals have been updated. We saw an increase of over 30% last month compared to January 2015! This gives us the needed motivation to keep at it for many years to come. We had our normal automatic investments in WalMart, Verizon, Unilever, and Microsoft through LOYAL3 and Computershare. In addition, we added 2 shares of Aflac (AFL). Overall, our new investments were a lot lower than what I had hoped for. Unfortunately, we ended up running up some bills over the holidays that we are working to pay off which limited new investments. We continue to track our 12 month forward dividend income each month. Several factors will determine if our forward dividends increase including: adding new shares, dividend reinvestment’s, and when a company raises its annual dividend. We are very pleased with where our future dividend income projections are at. There was a bit of a slowdown as you can see the last couple of months. Part of this was due to dividend cuts made by ConocoPhillips (COP). But the good news is despite losing a bunch of future dividend income, the other stocks in our portfolio made up for the loss! 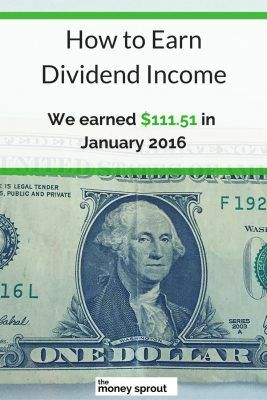 The dividend income earned in January ($111.51) was up over 30% from the same time last year. This is all a direct result of pumping more and more money into the stock market. This puts us in a good position to start the new year out as January is typically a slow month for dividend income. Our goal is to earn $2,250 in dividend income in 2016. 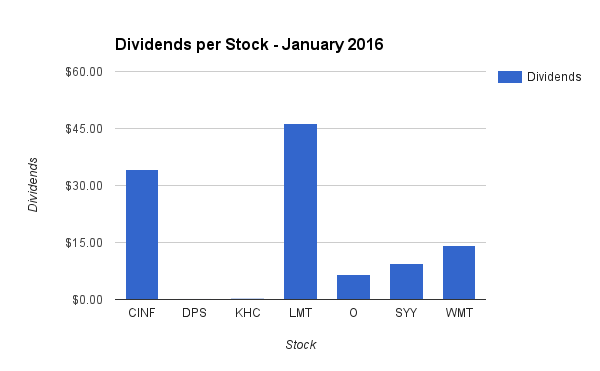 How was your dividend income in January? Are you selling any of your oil stocks that have recently slashed dividends? Full Disclosure – At the time of this writing, we owned shares in the following stocks noted in this post – AFL, CINF, COP, DPS, KHC, LMT, MSFT, O, UL, VZ, and WMT. The material above is not a recommendation to buy. Please do your own research on a company before deciding to invest.